You guys all know and love this lady that I’m lucky to call Mom. It’s really hard to know where to start with this one… If you follow me on instagram, you saw that this week I got really sick with the flu and was honestly, quite useless. Saturday, we are hosting a bridal shower in Madison for one of my closest childhood friends. In typical Mom fashion… she didn’t just postmates me soup (well she did that day one of my sickness). She got in the car and drove 3 hours to walk Obi, finish my laundry, pack my suitcase and DRIVE me back home to Madison so that I could get more rest. THAT is the exact kind of mom she is every day. Not to mention… she proof reads all of my content… helps me brainstorm, shoots my content and much, much more. SO! When it comes to her birthday I am always baffled by what to do for her because honestly, nothing can ever really be a big enough gift for this gem of a woman. This year though, I may have come KIND OF close. Thanks to the amazing team at The Peninsula Chicago I was able to pull off a two day staycation in an incredible suite… spa time, AMAZING meals at their onsite restaurants, Shanghai Terrace (favorite dumplings in the city), Pierrot Gourmet and of course, an epic room service breakfast. It was Mom’s first time staying at The Peninsula and I was SO excited for her to enjoy the incredible experience that comes with staying at our home town Peninsula Hotel. There are so many superlatives that immediately come to mind when describing what it’s like staying at The Peninsula. The service is unmatched and the entire staff is SO kind (must see photo below of our friend Scott who works at valet giving Obi a treat… the CUTEST). I could go on and on but Mom (of course) put it so perfectly. She said that when you stay at The Peninsula you’re in the complete lap of luxury but still feel at home. It’s not overbearing and you feel so welcomed and well taken care of with great respect for your privacy and personal space. One of my very favorite parts of staying here is their service for our furry friends. Saying Obi adores The Peninsula is a huge understatement. Everyone calls him by name and he gets so much love, attention and treats every time we go in and out. Not to mention…. they have a doggy room service menu and Obi’s meals come served on a literal platter. They provide a dog bed (it’s plush and velvet, of course) and food and water bowls so you don’t have to worry about bringing anything for your pup. They’re very well taken care of. When your Peninsula Fam comes to say hi in the middle of shooting! HA! The amenities here are unbeatable. You’ve never had room service this good, trust me. Our suite also had an incredible tub beneath a huge window overlooking the city. I’ve been using the skincare line Subtle Energies which is an Australian brand available in the US only at The Peninsula hotels. I indulged in a little self care time with their oils and a divine bath, of course! A visit to The Peninsula wouldn’t be complete without a visit to the beautiful Z Bar. Their cocktails and bites are SO YUM. I’ve had plenty of unforgettable girls nights on their rooftop bar which is to die for! I also hosted a super fun Galentines dinner in their beautiful indoor space in February. Can’t wait for to gorgeous rooftop to be open again for Summer! See the view in the photo below! I had to start the staycation off with a bang so we paid a visit to the Spa. There’s no better place to be anytime, but ESPECIALLY in winter in Chicago. 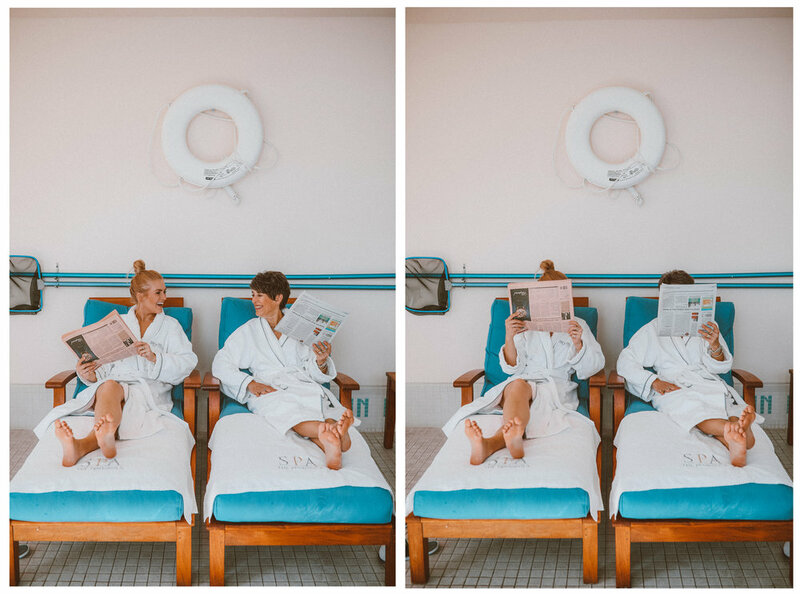 We started off with aromatherapy massages which were incredible (we both said some of the most therapeutic massages we’ve ever had) and then spent some time relaxing by the best indoor pool in all of Chicago. The big windows and humidity makes you quickly forget it’s Winter outside. If you’re looking for an unbeatable experience or unforgettable gift, I can’t recommend staying at The Peninsula more. You’'ll create memories you’ll never forget and be treated like royalty. A HUGE thank you to my wonderful Peninsula Chicago family for creating a birthday gift fit for the QUEEN.